There’s a few things that spring to mind when you hear the word “selfie”. From Snapchat dog filters, tourists with annoying extendable poles, Ricky Gervais in the bath, or that awful “song” by The Chainsmokers, there is no doubt selfies have become an integral part of pop culture. The word itself was immortalised in the English language when “selfie” was crowned Oxford Dictionaries 2013 word of the year. But the last place I expected to read about selfies was at EAHAD 2018! Allow me to expand. 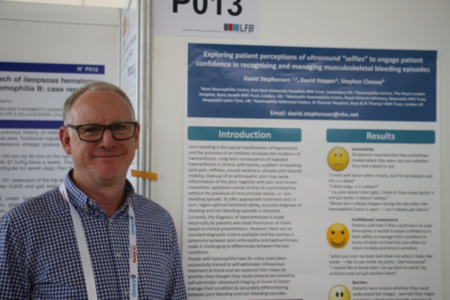 As I meandered through the poster exhibition one abstract caught my eye: ‘Exploring patient perceptions of ultrasound “selfies” to engage patient confidence in recognising and managing musculoskeletal bleeding episodes’. Now you don’t have to guess which word in that title jumped out at me. This small exploratory study essentially looked at the attitudes and opinions of a handful of patients towards doing ultrasound scans themselves to as a way of identifying joint bleeds and distinguishing them from arthritic joint pain. Many people with haemophilia will develop a target joint as a result of repeated internal bleeds, and this leads to painful damaged joints that can flare up for a number of reasons. From conversations with my peers in the community, there is a general consensus that it can often be difficult to tell whether you are experiencing the early signs of a joint bleed or whether your ankle, knee, elbow etc. is giving you pain due to the underlying joint damage caused by internal bleeds in the past. In the UK we are fortunate enough to adopt the “if in doubt, treat” method. But wouldn’t it be cool if we could use ultrasound technology to capture images of our joints? This could be such a useful tool towards accurately identifying bleeding. Now admittedly my first reaction to this idea was concern: that it would be too difficult and technical, too risky in case I missed a bleed, or just too much hassle. But I was fortunate enough to capture a quick interview with East Kent physiotherapist David Stephensen, the lead author of this piece, on behalf of Haemnet. The opportunity to hear about the idea directly from David really helped put it in a bit more context. The “oh yeah, of course!” moment for me was when he emphasised that we are talking about a group of patients who are taught how to self-infuse intravenously at a very young age, so why wouldn’t it be reasonable to assume that many patients would be competent enough to perform ultrasound selfies. David also highlighted how far the technology has come, whereby patients could potentially use a small device connected to a tablet to capture their own ultrasound scans, which they could share and discuss with physios in the clinic. The next steps would be to develop a training package and pilot study. I think this idea has huge potential and could really benefit a large number of patients. It ticks many important boxes for me: it leverages technology, empowers patients and focuses on prevention and recovery. I’d be really interested to hear what you think of this ultrasound “selfie” idea! Leave your comments here or on the social media post.